We all know that the iPad storage space is limited. It is impossible for you to store all pictures in the camera roll on iPad for you to appreciate all the time. A good method to save them for longer time is to transfer iPad camera roll to PC for backup. If so, you will be able to view your favorite photos on computer to reflect some wonderful moments. Are you familiar with iTunes? Some iOS geeks always use iTunes to download some great movies or enjoy some wonderful songs in iTunes. Besides, iTunes can play an important role in settling how to upload photos from iPad to computer. If you give a full play to iTunes, you will get unexpected good results. You can follow me to check out the detailed steps on how to transfer photos from iPad to computer using iTunes. 1. On PC, run iTunes and make sure its version is the latest one. Insert iPad into PC and then tap on “Trust” on iPad. On the main interface of iTunes, move to “Edit > Preferences > Devices” and then check “Prevent iPods, iPhones, and iPads from syncing automatically”. 2. You can manage your iPad photos in the camera roll to pack them in a bigger folder to enable the transfer process to be more convenient. 3. After that, tap iPad icon and then click on “Photos” option in the left sidebar under the menu of “Settings > Summary”. 4. Find the “Sync Photos” option in the right part of the iTunes window and then check it. Select “Choose folder…” in the menu under it and then browse your iPad to locate your desired picture folder. 5. At last, tap “Apply” button to begin the process to sync iPad photos to PC. After this process terminates, your iPad photos will be on iTunes. Cloud storage has become one popular concept in modern times, which offers great convenience to people who need to store some files online for later use. iCloud.com can also be used to fix how to transfer pictures from iPad to PC without iTunes easily. As for how to finish this target, you can check out the following contents. 1. On your iPad, navigate to the Settings app and then go to “Name/Apple ID > iCloud > Photos” to enable the “iCloud Photo Library”. After that, iPad camera roll photos will be backed up to iCloud space automatically in case your iPad is connected with Wi-Fi network. 2. On PC, open a web browser to navigate to iCloud official website and then log into it with the Apple ID that is being used on your iPad. After that, click on “Albums > All Photos” to view all iPad photos in iCloud space. Finally, you can choose them and then tap on the download button with a cloud icon and a downward arrow to save them to your PC folder. But if you fail to find your iPad photos online, you many need firstly to solve how to fix iPhone/iPad camera roll photos can’t show on PC. 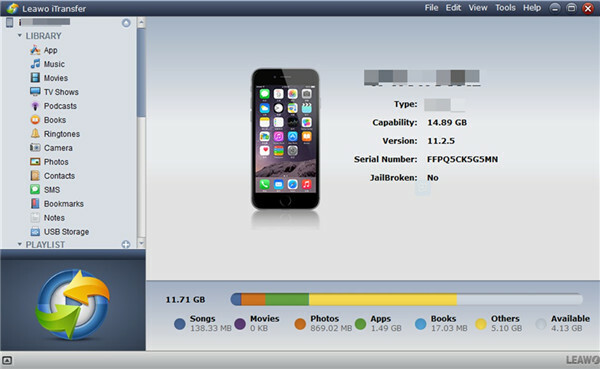 When it comes to the issue of how to transfer pictures from iPad to computer without iTunes, an ideal third-party program may be needed in this case. There are various types of transfer tools in the market, which makes it hard for you to choose the best one. Here I strongly recommend you use Leawo iTransfer as your best assistant software. Its amazing transfer functions and user-friendly interface enable you to deal with diverse transfer problems with just several clicks. If you want to know how to make it on earth with the assistance of Leawo iTransfer, the following instructions will explain the steps clearly. In order to solve how to add photos to iPad from PC via iTransfer, first you need to connect iPad with PC via useful USB cable and then click to run iTransfer software on PC. When iTransfer detects your iPad information and show it on main interface, you need to click on the iPad icon. Afterwards, click on “Photos” tab under the menu of “LIBRARY” to see all iPad photos. Choose your desired pictures and then click on the “Transfer” button at the bottom right of the window. You could also right-click on certain photos or select all the photos to delete iPad camera roll in one click. In the panel that pops up, you have to check the option of “Save to Folder” and then tap on the “Change” button to find a PC folder to save iPad photos. After the PC output folder has been set well, click on the “Transfer Now” at the button right of the dialogue to ignite the process to transfer iPad camera roll to PC. All these methods can be used to deal with how to import photos from iPad to computer or how to add photos to iPad from PC quite easily. You can choose your favorite solution to realize your goal.